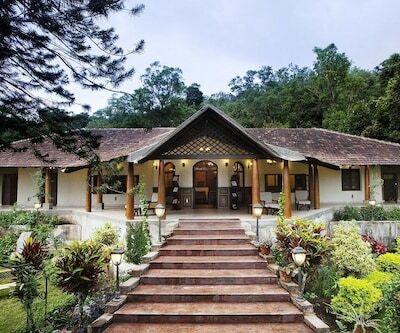 Vivanta by Taj Madikeri is a luxurious five star hotels which is situated at Galibeedu Post, Madikeri Coorg. The hotel is situated 5000 m above sea level. The hotel is 160 km away from Mangalore airport. Vivanta by Taj Madikeri offers 63 rooms with all the modern amenities. Each room features the panoramic views of the city. The rooms are categorized into Deluxe Delight, Deluxe Allure and a stunning Presidential Suite. One can enjoy International cuisine at ‘Ferntree’. The hotel has an outdoor swimming pool and a fitness centre.